Three Sheets is a brand new (2019) Saona 47 from Fountaine Pajot, perfect for larger groups up to 11 guests. She offers 5 cabin, which are 4 double guest cabins and 1 bunk bed cabin, perfect for children or crew. All 5 cabins have their own electric head and separate shower. The starboard bow offers an extra single bed. 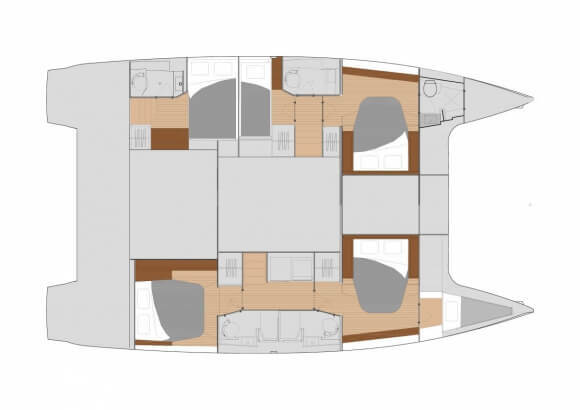 The Saona offers good visibility from the helm, multiple places to chat with friends or relax in the sun, comfortable accommodations and a clean and bright interior. 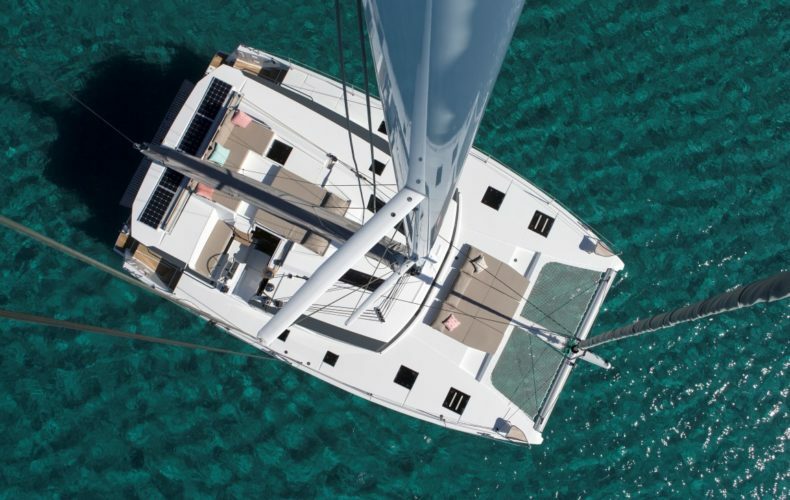 It is easy to move around the boat under sail, from transom to bow, up the three steps from the cockpit to the raised helm station to starboard, and up another three stairs to the lounging area atop the bimini, to port of the steps. For chartering, the Incidence main and slightly overlapping genoa provide ample horsepower for hopping along from anchorage to anchorage. The helm station, which can also be entered at deck level has a three-person bench, with the wheel and engine controls mounted just forward on a pedestal. There is a pass-through between the pedestal and the cabin top, where three winches (one’s electric to handle the halyard) and line-handling clutches are mounted.